"An eye for an eye makes the whole world blind. - Gandhi"
Here is an example - Steve Jobs. So, when Steve Jobs died, there were a lot of people who really felt the loss of the icon. Jobs is always considered as one of the icons who revolutionised the IT field. He was and continues to be one of the role models to all tech enthusiasts and programmers worldwide. Imagine how the world would have been if GUI wasn't there. It is not that nobody else could have come up with that, but then again, possibly anyone can come up with anything at any point of time. The fact that Jobs revolutionised the industry is not something you can discard. The era of personal computers began with Jobs and Gates and the continuous innovation their respective companies churned out along with other biggies like IBM. But after he died, there were some strange responses once the initial mourners stopped posting on Social Networking sites, notably Facebook. First, there were many who compared him to a million people who died of starvation. I wrote a post on it here. 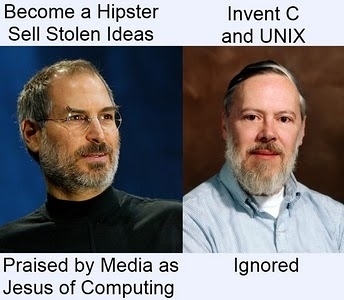 Then came the death of another great, Dennis Ritchie. 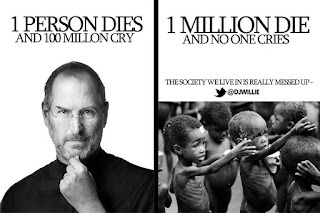 He was another great man, but unfortunately, his death did not receive as much media coverage as Jobs' did. So, people started belittling Jobs. What had he done? Did he ask that Ritchie shouldn't be hailed? Or does the fact that Ritchie's death was not covered by media and people didn't post much about him on Facebook and other sites make Jobs' achievements and accomplishments any lesser? The ideal response would have been the post Ritchie's photos and probably post about him if you really want to publicly display your sadness. But please don't go around insulting Jobs. They are both greats in their own ways. It so happened that I saw this photo of Gandhi and saw a whole lot of comments below it. They mainly called him a fraud, said spread the message and show that he was a fraud, etc. Some said that Gandhi and Nehru were enjoying with British women and that there were several others who were dying in the jail. That there many greater people who were in the jail, and Gandhi became a great. And so on. Now, to start off with, none of us who are currently commenting on him know for a fact the situation 60+ years back. Frankly, everything that we know about the past, is through whatever has been told to us - Either by parents, teachers or textbooks. And they also know it, not through their own knowledge. We hear great stories of great kings - How do you know they were great? We trust accounts of others. And these accounts may or may not be true. If those people were bribed to write good things, and those accounts were found now, one might assume that they were indeed the truth. Gandhi's accomplishments, again, like that of Jobs cannot be rubbished just because there were hundreds of other freedom fighters in jail. Gandhi himself was in jail on numerous occasions. People who were in prison knew what fate awaited them if they went against the British, and yet they did it, because they had conviction and believed strongly that the freedom of India was what was more important. They were heroes, no doubt. But as it often happens, we always remember the leader always. When the Mahabharata war was fought, thousands of soldiers fought bravely. Same in the Ramayana. Do you know the names of everyone? Why so old? When we say India beat Pakistan in the Kargil war or the 1971 war, do you know the names of the brave soldiers who died? Were they not great? We remember Indira Gandhi and Gen. Sam Manekshaw. Everyone has vices. Yudhishtira lost the game of dice which led to the war finally anyway. Do we remember his flaws, and does that flaw mar his greatness? Gandhi may be dancing here with some lady, that doesn't mean anything. And even if it did, his great tolerance, leadership and wisdom will not, in any way, become lesser. Gandhi said - An eye for an eye makes the whole world blind. Now even if you hate Gandhi for whatever reasons, do you feel this is a wrong quote? It is a gem of a quote, and his personal shortcomings in no way make his accomplishments any smaller, nor does it undermine those of the other martyrs. Everyone was great in their own ways. People often insult Gandhi when it comes to Bhagat Singh - again, before you jump to any conclusions, do a thorough research. Even after that if you still feel Gandhi was no good then by all means, go ahead. Raveesh Mayya: I wish to know how this dance make him a fraud !! Skanda Guruanand: not the dance, the character in him. People worship him blindly, being ignorant of his deeds. In the name of freedom fight he and Nehru enjoyed and the true fighters were being treated in Jails, some even killed for no good reason. Nikhil Baliga: This is what I don't get. People said Steve Jobs died and a million cried, and millions die in Africa because of starvation and nobody cries for them. Think about it - many people die, that doesn't make Jobs' death any lesser. And Jobs revolutionised technology and is great. Similarly, Gandhi has done a great deal of awesome things for the freedom of the country. Of all the great things, people pick this pic and start circulating it. Do you think you can have the guts to do some of the things he did? With that level of tolerance and mental strength? You cannot belittle the greatness of a man by a couple of things here and there. Who said Gandhi wasn't jailed? That way, would you belittle Lord Krishna for having many wives? That way, everyone is a fraud, pick any guy in the world. Sneha Raghunandan: Why idolise someone like this and call him the "father of our nation"? He is highly overrated. People who actually fought the freedom struggle aren't being given due credit!!! Skanda Guruanand: I do agree to the facts that he did some great things for the freedom of the country. I have no doubt about that. But, I believe that at the cost of other people, for his own good he did many things. 1) What was the necessity for sending Indian soldiers to fight for WW II in support of British. A true patriot wouldn't have even thought about that. 2) During partition-riots in 1947, so many Hindus were massacred by Muslims. A person who fought for independence with Ahimsa for decades couldnt bring his methods then? 3)As u said "with that level of tolerance and mental strength"...where was his mental strength when Sardar Vallabhai Patel won the votes to become the PM, and he negotiated with him to make Nehru as PM. 4) What is the difference in people when fighting for freedom. Gandhi and Nehru were given special treatment in jails. Why was V.D Savarkar sent to Andaman and kept in solitary confinement and ill-treated? I would like to answer your qn "Do you think you can have the guts to do some of the things he did?". My answer is I may not have the guts he had. But I definitely am sensible enough to decide what is right and wrong. I would say ur comparison with Lord Krishna or Steve Jobs as sheer ignorance. Nikhil Baliga: Skanda - Just because you don't agree with his methodologies doesn't make him wrong. This has become like people talking about what should be done in cricket matches - Send out spinners, no send out pacers. He did what he felt was right. When a person is at the helm of affairs, they are under a lot of pressure - everyone can do armchair debates now that we know how the course went. "The Indian National Congress, led by Mohandas Karamchand Gandhi, Sardar Vallabhbhai Patel and Maulana Azad, took a strong stance against Fascism and Nazism. Gandhi, in an open letter to Adolf Hitler, touted tolerance and viewed Nazism as a source of violence. Several other Indian leaders and politicians expressed concerns over the rise of Fascism and Nazism and supported the British cause. However, Jawaharlal Nehru pointed out the inherent contradiction in the British argument of going to war with Nazi Germany for the sake of freedom, since India was denied that same freedom. He pointed out that Nazism and the British Raj represented the two core ideologies the Congress was fighting against — imperialism and racism. It was because of this perceived hypocrisy of the British Government, that the Congress refused to align with Britain's fight against the Axis Powers until India was granted independence"
‎2) Partition - What do you want him to do? He did everything he could. Also, if you read the world war post, it says Nehru did the right thing - But you don't like Nehru either... Like I said, they all had their pluses and minuses. In the end, they are what they are - You can agree or disagree. That doesn't make them bad. If everyone of your decisions are perfect when you are at that kind of a position, then perhaps one can make such a remark. When a million people have their hopes on you, and when your actions can affect a million people, things aren't as easy as they sound. 1) Einstein on Mahatma : "Generations to come, it may be, will scarce believe that such a one as this ever in flesh and blood walked upon this Earth"
2) Steve Job's brain child, "Think Different Campaign" featured the Mahatma. ‎Skanda, its great to think that having an opinion against established facts makes you a Thinker or a cool guy. But the fact is, the world just doesn't care what you and I have to say about the Mahatma. We are just another brick in the wall, yet we seem to be the noisiest lot.. No point of debating on your wall as we're a bunch of dogmatic individuals. Ashwin Kumble: I would agree with Skanda Guruanand. I am cool if u consider him Mahatma with his defects but please give a thought that some or many might not! Skanda Guruanand: Did Gandhi ask for special treatment in prisons?..rather than this..My question is "Why" was Gandhi given special treatment and not other freedom fighters who were equally involved in the struggle. Regarding the comparison, I dint understand why u thought of Krishna, having many wives to compare with Gandhi. 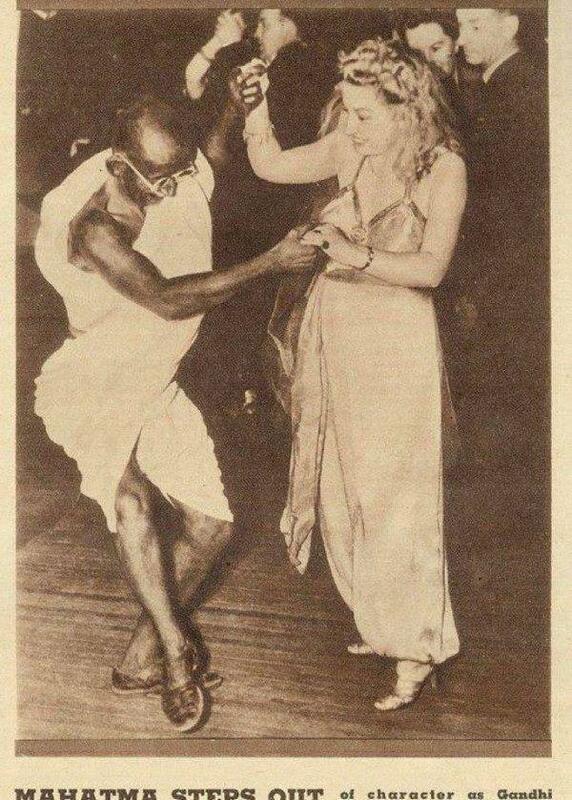 (I shared this photo, because I was ashamed to see a leader who guided a nation to freedom, a freedom fighter whom people "believed" in, enjoyed dancing with a British when the entire country was against them). And coming to Steve Jobs, i agree he influenced millions in a big way through technology. You compared Jobs with Gandhi because they are icons. But when I compare people, I look at the work they have done, their contribution to the society and their character and not just because millions worship and I should also do the same. Bharath Srivatsa: ‎Skanda I agree with just one point you've made. The strong support he offered to Nehru in becoming the PM of free India. The rest doesnt make much sense as Raveesh has summarised it in the above comment. For what we may know, MK Gandhi may just be dancing to the tunes of Vande mataram !!! Skanda Guruanand: Hmm Bharath Srivatsa why does it not make sense to speak about other issues when you know such things have happened? I agree with summaries of what Raveesh and Baliga have made. But honestly, I feel people must know some true facts before they comment. From Baliga's post, he mentions "We trust accounts of others. And these accounts may or may not be true. If those people were bribed to write good things, and those accounts were found now, one might assume that they were indeed the truth." How do you trust that things written in history books are truth? Authors could be sycophants. I'm firm on my stand in the case of Gandhi. And I'm surprised you saying that "MK Gandhi may just be dancing to the tunes of Vande mataram", a song which is sung by millions with respect and not a Bollywood item number. If at all what u said is true then ur comment itself speaks of Gandhi's character. Vibhav Kumar: We can have different opinions about a person, event anything, but to call someone who's no more to speak for himself a fraud, characterless etc. is disgusting and shameful to say the least. As a mature individuals, we have all the right to disagree but to call anyone names is plain wrong. For all we know, we might know nothing. Bharath Srivatsa: ‎Skanda I dont know much about the true facts nor can I take a stand on history mislead by intentional manipulation for the interest of one man nor am I saying Gandhi is a Mahatma in the true sense of the word. All am saying is, the old man deserves a little respect for the values he stood for and the cause he fought and the means he employed for the cause. All that we (our generation, with exceptions) have done is made extensive usage of verbose statements on FB and twitter pages to voice out our emotions / arguments. We don't (atleast I don't) have it in us to stand up against whats eating up our nation and face it head on. So, I feel its too disrespectful of us to debate on such an issue, which has resulted because of the sacrifice of millions of martyrs. Gandhi is great, so is Bose, so is Bhagat Singh and so are the million others whose names we don't even know. I don't care who Gandhi is dancing with... the old man starved for us for several days, let him have his share of fun !!! Vibhav Kumar: Generalizing is perhaps the worst thing we can do. We were fighting against the British - Army, country whatever. But to say that each and every British was our enemy is just against the basic principles of justice. We have fought wars with Pakistan. So should that stop me from having a Pakistani friend? Should I always hate every Pakistani then? Totally agree with Bharath Srivatsa. If nothing, then at least don't malign and affront. It would be the biggest travesty if we start "comparing" the efforts and sacrifices of our freedom fighters - knowing very well that we can't even do a fraction of what they did for our country. When Windows released GUI, Jobs confronted Gates about stealing GUI from apple. Gates said, "No, Steve, I think its more like we both have a rich neighbor named Xerox, and you broke in to steal the TV set, and you found out I'd been there first, and you said. "Hey that's no fair! I wanted to steal the TV set!"". So, no, even without Jobs, we would have GUI. That being said, I agree that Jobs was a technological icon. And every icon, technological or otherwise, had flaws, like all humans do. But that doesn't negate their achievements. We see these debates and mudslinging frequently is because people try to see in black and white. They think that a person who is commemorated should be all blameless. They cannot accept even a minor fault, either with the icon's personality or character or actions. We should be respecting what the person was able to do, what his/her strengths were, rather than blaming them for their faults. At the same time we should not be ignoring their faults at all. Lessons need to be taken from a person's life with context. "Totally agree with Bharath Srivatsa. If nothing, then at least don't malign and affront. It would be the biggest travesty if we start "comparing" the efforts and sacrifices of our freedom fighters - knowing very well that we can't even do a fraction of what they did for our country." This is a very pessimistic conclusion drawn from the wall of text I read. In the modern age we live in today, we have to exercise the very powers the great freedom fighter fought for. Equality, democracy and universal adult franchise. 1) We can do a whole lot more than a fraction by not only voting ourselves, but convincing all our friends that it is cool to vote too. I flip my lid if someone who hasn't had the time to vote starts complaining. Mr./Ms. if you couldn't find the time to spend an hour or two every 4-5 years to exercise your power, then you are insulting the efforts of the aforementioned Freedom fighters. Shame on you is what I feel. It kills the entire idea of democracy, when informed adults don't vote and politicians find the uneducated vote bank a greater factor than us "educated ppl". Point 2) The more passionate among us should seriously consider entering politics. Countries like USA and UK, have had huge strides in public infrastructure because despite all politics and corruption which is prevalent there too, their leaders were smart enough to realise the value of public infrastructure in drawing FII (part of which may/may not fill their pockets). I think i may have deviated slightly, but sorry those may be side effects of MS studies.